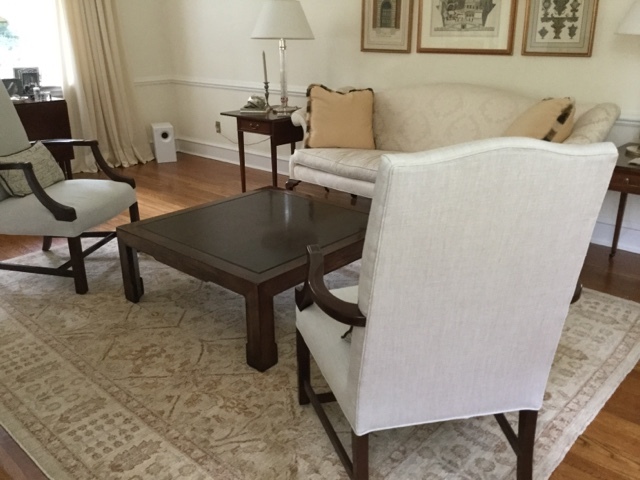 A hand-knotted 8x10 "Silk Flower" rug from Brandon was selected to complete the dining room in our Jamison customer's new home. Dressy thanks to the silk, but with a transitional India Agra style design, the rug provides a relaxed elegance to the area which conjoins the living room in an open floor plan. 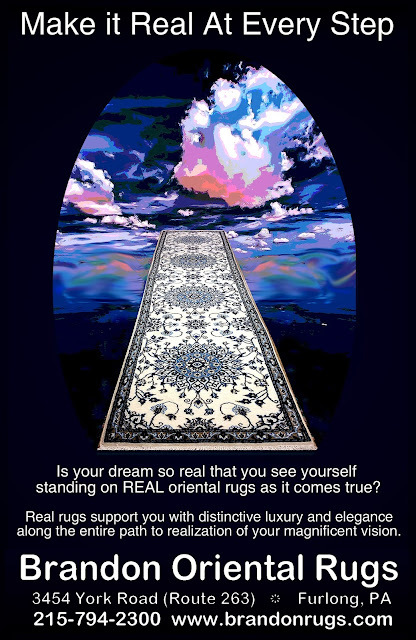 When you are putting your dream of life together, think seriously about seeing yourself atop oriental rugs at every step as your goals are realized. Real rugs bring a distinctive difference to the rooms they grace. They are symbols of luxury, achievement and an elegant lifestyle. As such, they reinforce and support a lifestyle committed to excellence, and are rewards for exceptional achievement. No matter how modest, or unassuming the first step; the presence of a real oriental rug in the mix makes everything happening around it bigger and better ever after. If you are dreaming of having it all, from conception to realization oriental rugs provide a beautiful place to stand. And like any indispensable tool you want to have, fine quality rugs are not just aspirational goals, they enable goal achievement. Make sure that very special rug is in your very special dream for the good life you want to have. 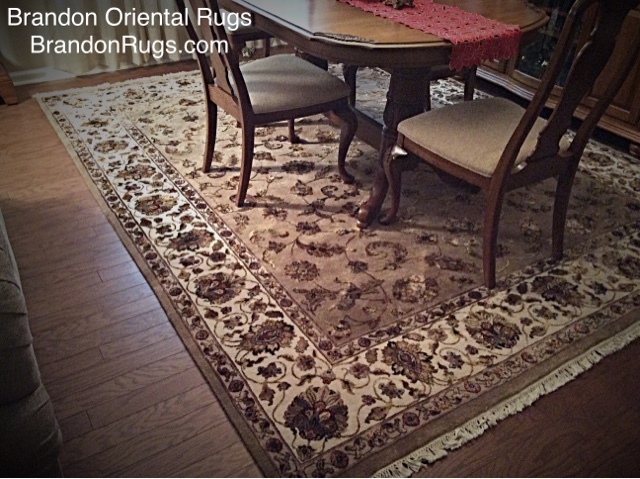 A brief tour of Bucks County, PA rug store Brandon Oriental Rugs - www.BrandonRugs.com - (located within minutes of Doylestown, Newtown, Peddlers Village, New Hope, Chalfont) made in conjunction with the 2015 Christmas holiday shopping season. The video displays just the surface of the outstanding inventory of fine quality handmade oriental rugs custom selected for Brandon's customers, and all connoisseurs of the art of rug making. Need a big wall decorating solution? 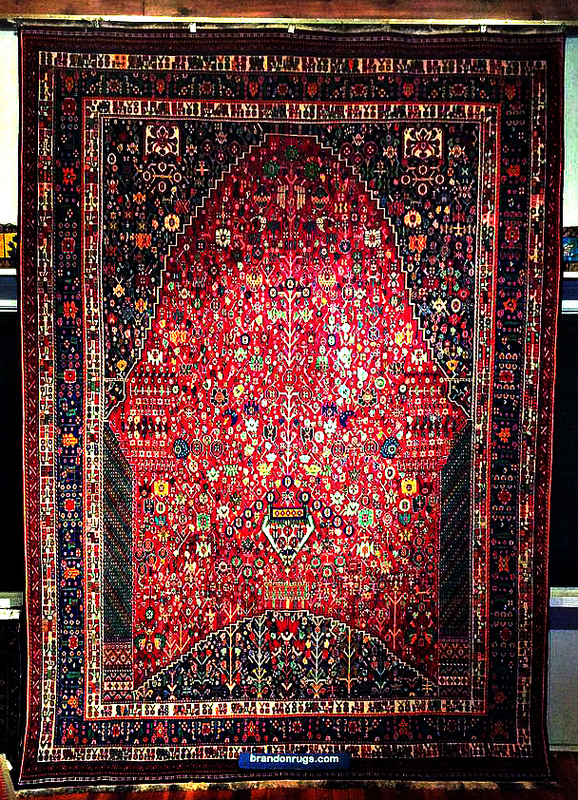 Don't ignore the utility of real hand-knotted oriental rugs to satisfy the need. One way, pictorial designs are especially appropriate. This 7x10 Persian Kashkoully prayer-design rug costs a fraction of what a similarly sized tapestry, or custom framed print or painting would. Bucks County rug store, Brandon Oriental Rugs can help you find something perfect for your taste and the unique challenge of your wall space. We can also help with ideas regarding the best ways (depending on rug type and your home's construction) to hang oriental rugs on the walls. 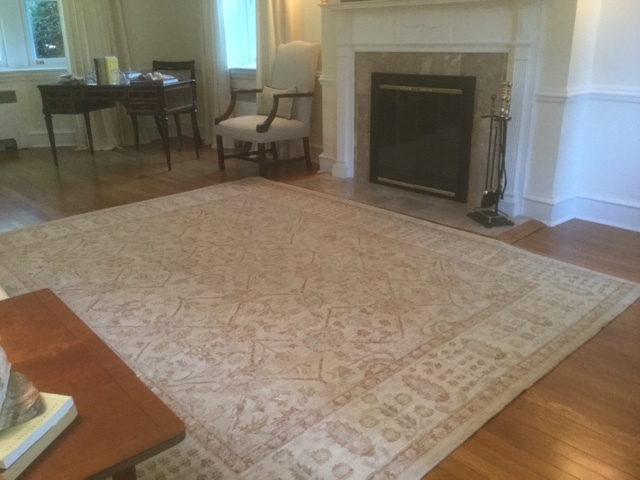 Previously, Brandon Oriental Rugs posted on Twitter about our efforts on behalf of a Bucks County, PA interior designer whom we have helped on numerous projects. 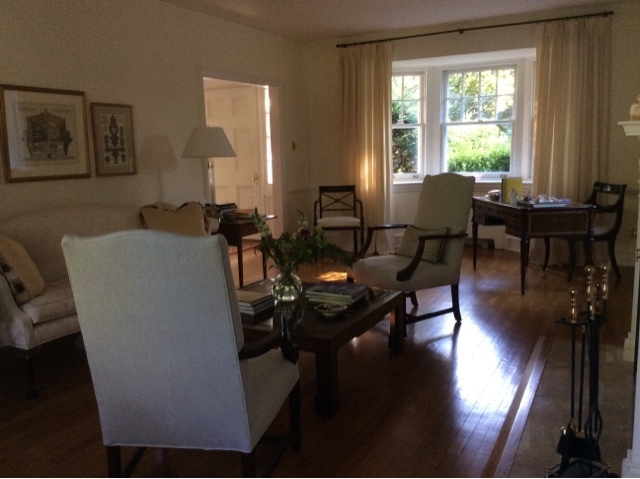 This particular project was slightly more challenging for her however, because it involved the direction she is taking to redecorate the living room of her own home. 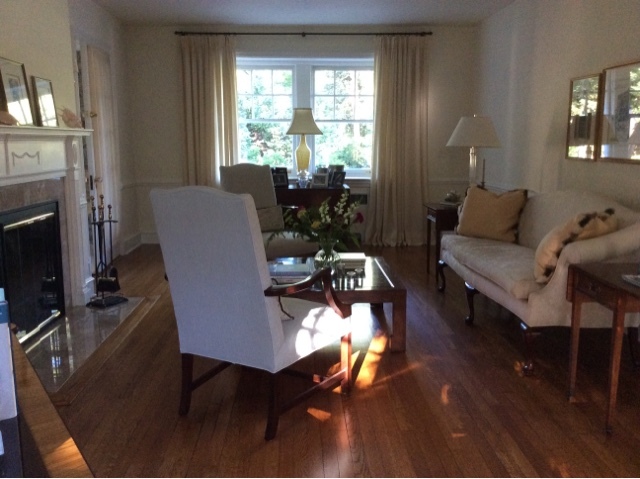 The "BEFORE" images above and directly below, show that the designer has started the transition of her living room from rigid formality to an overall more relaxed look-and-feel suggested by the arm chairs, glass top coffee table, and Shaker-influenced end tables. The sofa is scheduled to be re-upholstered, the window treatments are being changed to Plantation shutters, and the wall color (to be determined) will go from pale yellow to a warm gray neutral. 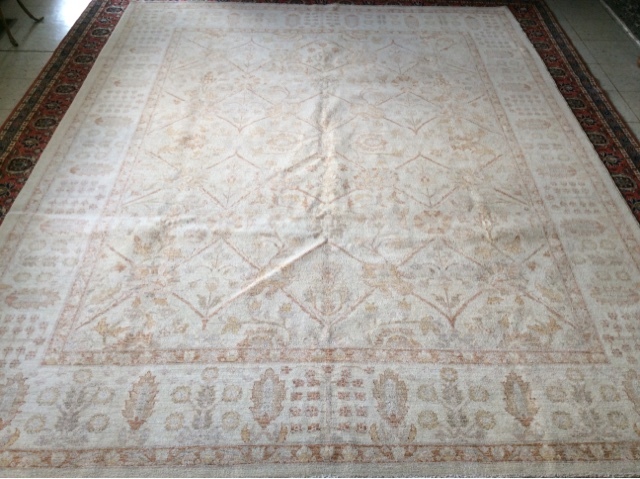 The rug chosen (after the pre-screeening of multiple alternate selections outlined above in the TWITTER post) is an 8x10 Pakistan (Peshawar) Khotan collection rug (shown below on the day of its arrival and unveiling at Brandon's one and only location just outside Doylestown in Buckingham Township, Bucks County, Pennsylvania. Made with 100% hand-spun, vegetal dye wool yarns on a cotton foundation and given a signature "silver wash" to impart the crisp, linen-toned background color associated with Khotan Collection reproduction oriental rugs, this rug brings the impact of a REAL hand-knotted oriental rug to the design plan with a subtle, subdued, understated complementarity. 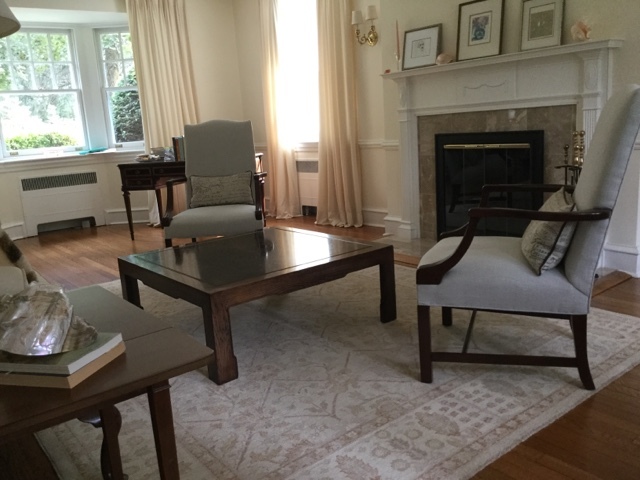 Seen in the images below in the living room of the designer's Langhorne, PA historic district home on the day of installation, her beautiful new rug is right at home with all she has done in the room, and with the new directions in which she is taking it. In order to give her time to organically develop her vision for the room, Brandon made every effort to find a common ground between where her room began and where she hopes to take it that was not in any way a compromise away from the ultimate goal. As her plans develop and are realized, she may continue to enjoy the comfort of a rug that is well coordinated with everything past and future in her home.